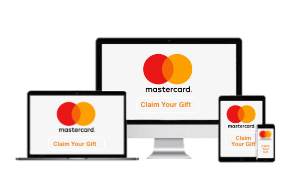 Give your customers, clients and employees Mastercard gift cards. Mastercard reward cards can be customized to reflect your brand and appreciation. Your customers, clients and employees can use them anywhere Mastercard debit cards are accepted. Choose from our gallery of pre-designed Mastercard reward cards. 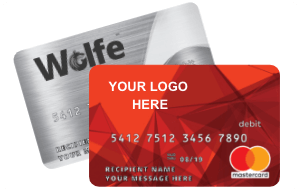 Put your logo on one of our pre-designed Mastercard reward cards. Digital Mastercard reward cards are delivered electronically. Place your order and links to the rewards are instantly available. You get a list of unique website links for each reward to bulk download or to send to recipients individually. 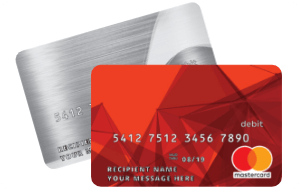 Recipients receive their digital Mastercard reward and claim it. Recipients simply provide their name and address to retrieve their digital reward via the link you send them. Happy shopping ahead: digital Mastercard rewards are easy to use. Recipients can shop with digital rewards online, over the phone or anywhere a physical card isn't required. What makes Mastercard the right choice for your reward program?